There are several games that touch upon the life of a farmer or herder, with or without the option to fight monsters and go on adventures. For example, franchises like Harvest Moon, Rune Factory or the popular Stardew Valley will take you on such a trip. 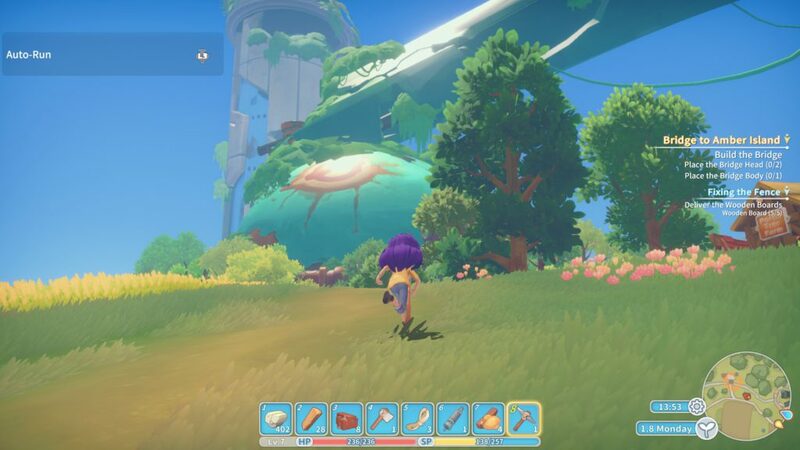 With My Time at Portia, you are able to dive into a new world where you can do a variety of things, like farming, dating, fighting but also fishing and crafting. Combining some refreshing elements, you’ll be able to dive into this extensive game and have a blast. You arrive at Portia, the old town of your father. 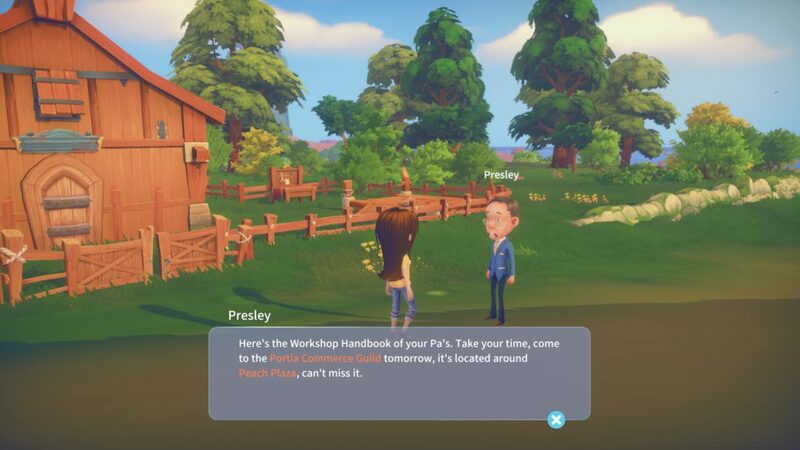 After he passed away, you take the ferry to the old workshop with the plan to make it flourish again. You’re greeted by Presley, the Commissioner of the Portia Commerce Guild. At first, things seem to be going well. The house needs some repairs and you have some basic tasks to start with, but the available work is all taken by Higgins. He is the leading builder of the region and he doesn’t want you to take his hard-earned spot. Thank goodness that there are some small commissions to start with. The townspeople might be a bit quirky at times, but you’ll fit in faster than you think. 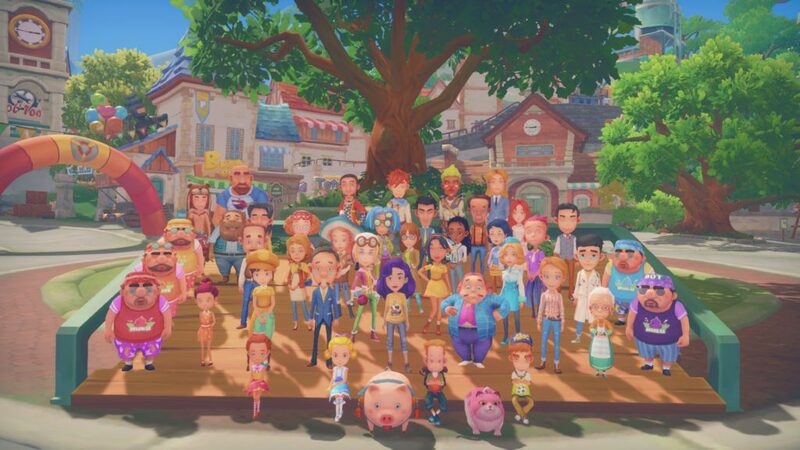 This is the start of your time at Portia. Depending on what you do in a day, the story will evolve in a different way. For example, if you go on adventures and visit the ruins or other locations, chances are high that you’ll run into some monsters and maybe some bosses here and there. More of a farmer? After a while you’ll be able to plant crops and focus on that. Of course, there are quests and commissions for you to do as well, but it’s up to you when you will tackle them (don’t forget about the deadline when you do take an order though). It gives you a feeling of freedom, as you can take matters in your own hands and decide what you want to do without a fixed storyline. It certainly is something refreshing, especially with all the different options you have. If you were hoping for realistic graphics, you’ll probably be disappointed. What you will get though, are bright comical graphics with splashes of color all over your screen. The characters stand out against the environment and with the several options you have to choose from when creating your toon, you can be the star of the game with your creation. Some of the options might make it a bit ridiculous, but whatever floats your boat of course. The background is well-defined, it gives off a very tranquil and painting-like vibe. The edges are slightly darker to make it pop a bit more and the different colors make it one splendid entity. Depending on the area, the surroundings will change and will take you to a whole different world. Obtainable items are sparkling, making them stand out a bit which makes it easier for you to spot them. Music wise, the tracks tend to loop rather fast which is mostly noticeable when you play the game for a longer period. If the weather changes or if you start a battle for example, the music changes to fit with the current situation or mood. Depending on the activities of that day, you might hear the same song over and over, while at other times it might be a huge variety. The tunes fit with the purpose of the game and you’ll be able to dive into the town life faster. The developers were still adding voice acting while testing the game, so at this point there isn’t much to mention about this part. There are already sound effects though, which add an extra dimension to the title. It’s not really realistic but it fits so well with the graphics, so be ready to hear some more comical-like ambience. 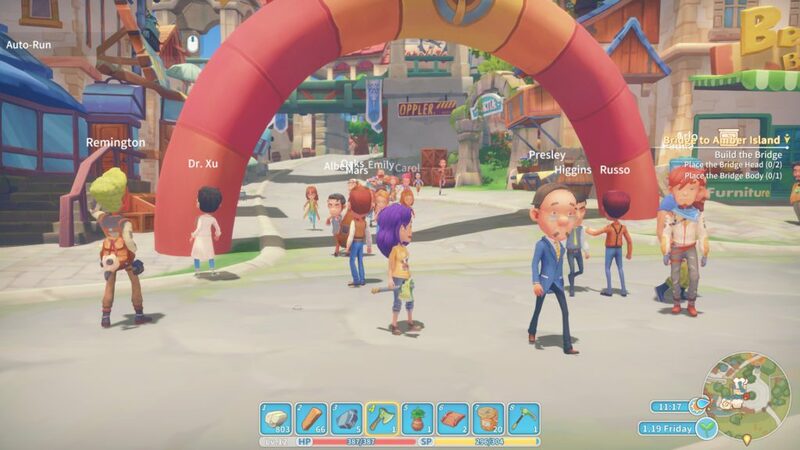 My Time at Portia is an adventurous simulation game with RPG elements. There are a lot of things to do in this title, going from building to farming, fishing and dating while you can also get lost in some of the ruins. There are quests, requests or commissions for you to fulfill but it depends on what you want to do of course. Portia has a variety of activities for you. Of course, you won’t be able to do all at once as you need to unlock certain blueprints or just gain some levels. It might even take a while before you can actually do something else as the game feels rather slow. This might be related to the first big construction you have to do needs a variety of materials that require you to build new work areas, which also need resources. Even if you gather items every day or go to the ruins regularly, it will take you a while before you’re able to finish the order. 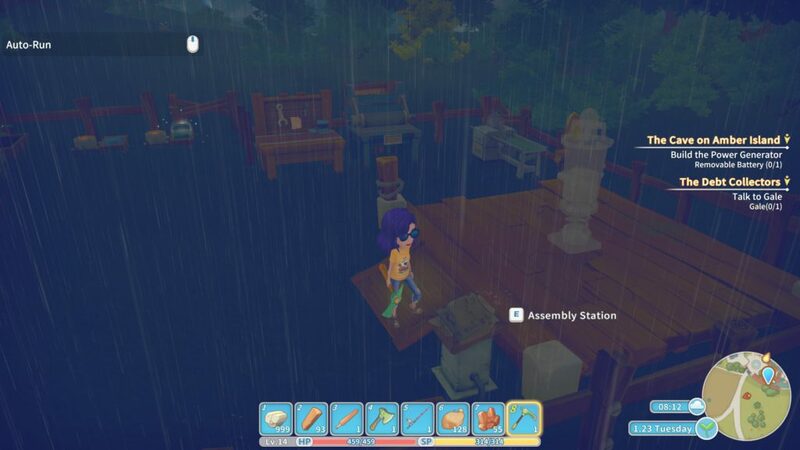 If you keep into account that you also need Gols to buy certain items, it’s kind of a necessity to take some requests or try to get money in a different way like building furniture or sell some materials. The RPG elements are mostly related to the experience you can gain and the skill tree. Whenever you do something in the game, being it battling or gathering, you get some experience. When you gained enough, your level increases and you gain another skill point. These points can be added to three different skill sets. Depending what you find more important, you can distribute your points however you want. For example, if you would love to get some help with your social skills, you can put some points in that skill tree. Gatherers/builders and adventurers/fighters can also get some benefits. When you make progress in the game, you’ll be able to expand different parts of your property. For example, you can remodel your house, gain more land and do whatever you want with it. Want to put some more sheep on it? Sure! More crops? Go ahead! Maybe some extra work stations for all those orders? The choice is yours. Of course, everything you do has an influence on your stamina. Cutting trees, fishing, fighting, … it all depletes your energy and makes you worn out. Food and other items will increase this again, so keep some items in your bag when you’re going out for an adventure. Also, you will fall asleep at 3 AM, no matter where you are. It might get tricky when you are somewhere dangerous, so keep an eye on your clock. Next to all the exciting things, you can also delve into the social part of the game. There are a lot of townsfolk running around, who you can talk to or give gifts. With some people, you can also spar for example or play rock, paper, scissors. Doing all these things will increase your relationships and you’ll be able to even woo some bachelor(ette)s. Go on dates and get together, get married and live a happy life. It’s all a possibility in My Time at Portia. The mechanics of the game are fluent and you’re able to play with keyboard as well as a controller. Some elements feel a bit off though, for example when you need to build bigger parts at the assembly station, you have to have the materials selected in your hotbar. It’s not just enough to have it in your bag, or just in your quick menu, you HAVE to have it selected. This is kind of a hassle at times and this is not the case with the other stations. It’s something to get used to but it might take a while before it’s in your fingers. 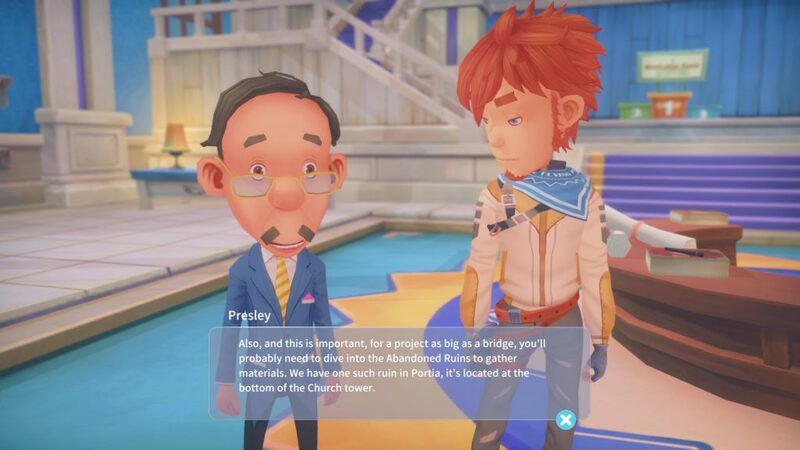 If you are looking for a fun game that has the same features as for example a Harvest Moon title, and even more than that, be sure to check out My Time at Portia. You’ll be able to tackle a variety of things, depending what floats your boat. The world you’ll be able to visit is clad in colors and although it’s not realistically made, the style surely will charm you. Music wise, everything fits well together but it might get boring rather fast. Some mechanics might feel a bit off at the start but you’ll get the hang of it sooner than later.